This Disability Access Statement outlines facilities available for guests who have allergies or are mobility, hearing or visually impaired. 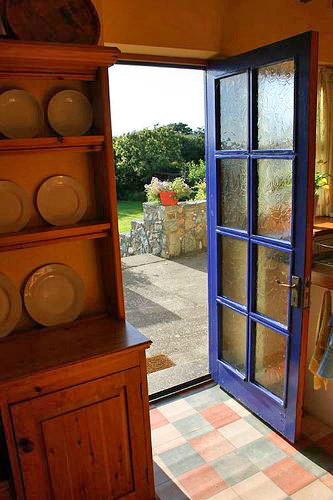 Y Stabl is a converted farm outhouse offering self-catering holidays for up to seven people. Y Stabl has four bedrooms on two floors. 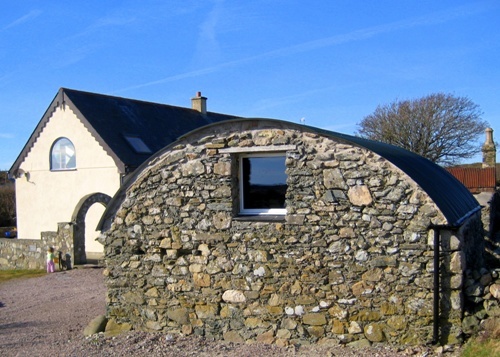 Y Stabl is located in the rural area of Rhoscolyn on the Isle of Anglesey in North Wales. The nearest main town is Holyhead, approximately four miles away. There are daily direct trains to London (approx. four hours), and a frequent ferry service to Dublin. Road connections between England and through Anglesey are excellent, although the roads in Rhoscolyn can be very narrow single lanes. The entrance gate post gap is 245 cm. We have two designated car parking spaces for the house- in front of, and behind, the stable/ outhouse, plus additional communal parking space. Our parking spaces are approximately ten metres from the front door. Cars can stop directly outside (one metre from) the front door for passenger and luggage drop off. The gravel driveway between the parking spaces and front door is reasonably level. There is a shallow (13 cm) step to negotiate at the front door; the front door is 75 cm wide. Ground Floor ('Downstairs'): The ground floor level consists of entrance hall, bathroom, kitchen dining room and large double bedroom. All rooms on the ground floor are at the same elevation and level, with no steps between the rooms. Bathroom: The main bathroom (dimensions 215 cm x 195 cm) on the ground floor has an entrance door 65 cm wide, and consists of: Toilet; bath with shower, and basin. The bath is 53 cm high, the toilet is 44 cm high and the basin is 78 cm high. The linoleum floor covering is level. Kitchen: The kitchen entrance door is 75 cm wide. The worktop height is 90 cm. The linoleum floor covering is level. 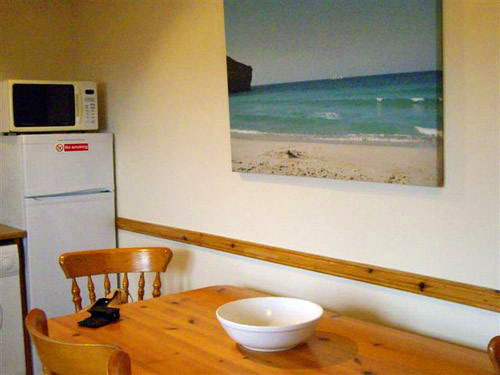 Double bedroom: The large downstairs double bedroom entrance is 73 cm wide and is very spacious with plenty of space. First Floor ('Upstairs'): This floor is accessed by a steep staircase with 13 steps (each is 20 cm high). There is a handrail on one side, and the stairs curve 90 degrees towards the bottom. The first floor level consists of living room, toilet room, double bedroom, twin bedroom and single bedroom. All rooms on the first floor are at the same elevation with no steps between rooms. This whole floor is carpeted. Living Room: The main living area entrance is 70 cm wide. The room has one 3-seater sofa, and four easy chairs. A remote control television with separate FreeSat receiver (digital TV) is provided. Toilet Room/ WC: The WC (170 cm x 138 cm) on the first floor has an entrance 57 cm wide, and consists of: toilet and basin. The toilet is 45 cm high and the basin is 78 cm high. The linoleum floor covering is level. Bedrooms: The door widths are 74 cm for the double and twin bedrooms, and 71 cm for the single. The beds use non-feather pillows, and duvets with poly-cotton covers and sheets. The upstairs double bed is lower than standard. General: The walls are magnolia throughout, and all doors and frames are pine. All light and power switches are at sensible height.